On most warm weekend mornings when we’re home, my husband and I enjoy watching the activities on Mission Bay, where standup paddleboarders (SUP) mount their boards and ski boats start circling the bay at daybreak. By 9 or 10 a.m. the mellow mood of early morning has passed and frenetic action takes hold, with swimmers, paddleboarders and kayakers keeping close to shore while Jetskis and speeding ski boats weave among them and dash between sailboats, routinely courting collision. Don’t these powerboat drivers have any common sense, we wonder? Haven’t they ever taken a boating safety course? Or bothered to read city regulations about operating a boat on Mission Bay? The answer to all of these questions is, clearly, an emphatic no. Common sense would dictate that anyone operating any motorized vessel, let alone a fast powerboat, would know to maintain a safe speed and distance from any swimmer, sailboat or human-powered vessel, such as a SUP, canoe or kayak. Yet we routinely observe skiboats, usually pulling a skier or inner tubes with children aboard, invading the shore-side zone designated for swimmers. Frequently we see ski boat drivers looking behind them at their tows, not forward where they’re going. Often there’s no legally-required spotter on board. Typically they can’t see swimmers’ heads bobbing in the water or low-profile canoes or kayaks because they’re obscured by the boats’ elevated bow. 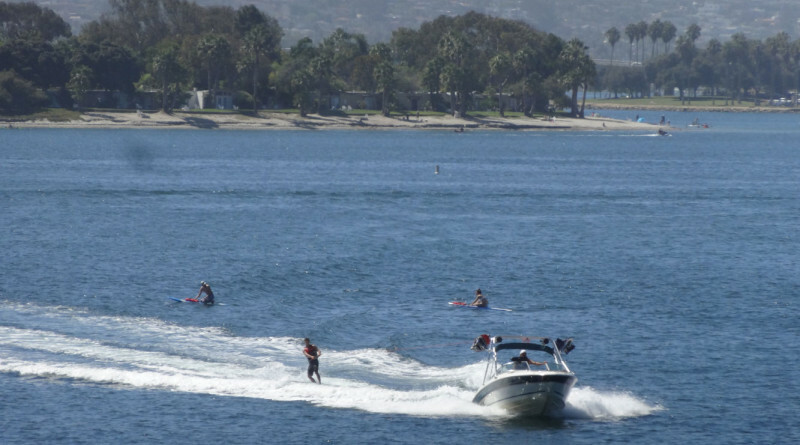 It’s a tragedy waiting to happen – and boating accident statistics indicate it happens far too often, not just in Mission Bay but in every inland waterway. At many Mission Bay marinas and the Lifeguards’ Quivira Basin station, you can pick up a map of Mission Bay listing rules and regulations relating to recreational activities. Or download the Mission Bay Park Regulations pertaining to boating from the City of San Diego’s website at sandiego.gov. Yet these regulations are regularly flouted, sometimes with tragic consequences. In 2013, the last year for which full statistics are published, Mission Bay alone had 39 boating accidents, half of which involved injuries. Of those, 37 percent involved collisions with a vessel, 53 percent excessive speed, 53 percent personal watercraft and 32 percent towing sports. Be a sensible boat operator. Don’t speed in congested areas. Require passengers to wear PFDs. Maintain a safe distance and, most important, watch where you’re going. The life you save may be your own — or your child’s.